Thank you all for your input on the previous unknown tintype. This is the kind of mystery that I find so fascinating when going through old photos – how to recognize people from the past whom you've never seen and do not know? When my uncle Jim died, pretty much every family photo he possessed came my way. I'm just now starting to sort through the box of family photos he owned. There were actually a few tintypes, all about the same size, right together, which has lead me to believe that they may have come from the same family. Unfortunately, I immediately recognized none of them. I can with confidence say they didn't come from my grandfather's side of the family since he left home young and didn't even have a picture of his own parents. I can also say they aren't my grandmother's maternal side as I already have other photos and it doesn't look like any of them, so I'm pretty sure these photos are from my grandmother's paternal side. The question is where do these people fit? Here's another of the tintypes. Part of my problem is that tintypes were in use for such a long period of time here in the United States (approximately the middle 1850s to about 1900). 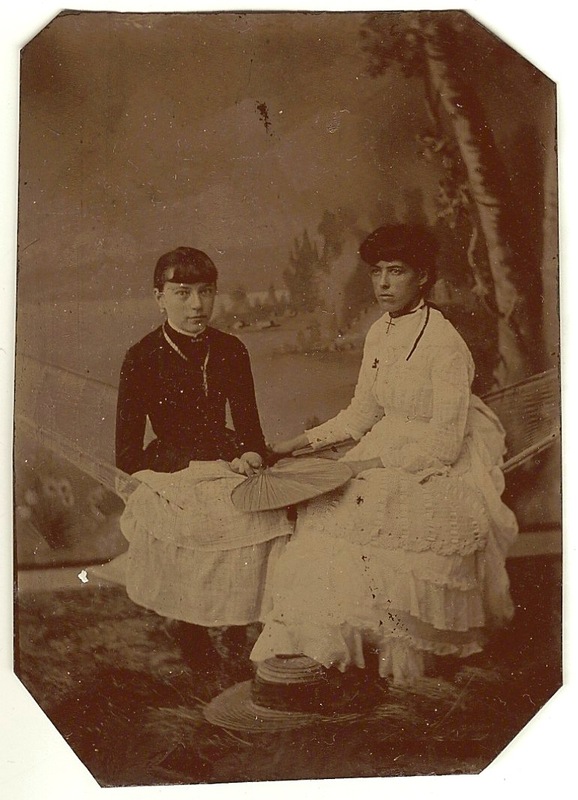 I have a few guesses as to who these people are, but I think my best guess right now is that the older one is Adella or a close relative. 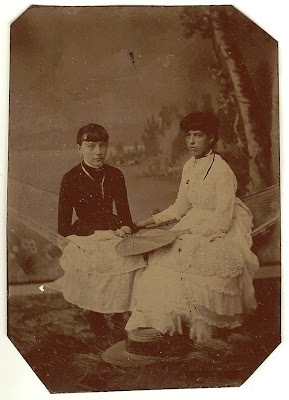 That would make the two in this photo some combination of Alice Livonia Benton (1871-1896), Delia F. Benton (1878-abt 1900), or Nellie May Benton (1886-1931). The trouble is that they may be cousins or some such thing and then this whole scenario is off a bit. I wish I was better and identifying fashions in time. I can give a general range, but what do you think of the two in this picture. If someone is an expert at guessing time based on dress, I'd appreciate your guess. I'd say the fashions suggest a date of early to mid-1880s.